JOHN CAMPBELL, OF WALDEN, NEW YORK. SPECIFICATION forming part of letters Patent :No. 271,219, dated January 30, 1883. Be it known that I, JOHN CAMPBELL, of Sheffield, England, and a resident of Walden, iii the town of Montgomery, in the county of Orange and State of New York, have invented certain new and useful Improvements in Plane; and I do hereby declare the following to be a full, clear, and exact description of the invention, such as will enable others skilled in the art to which it pertains to make and use the same. 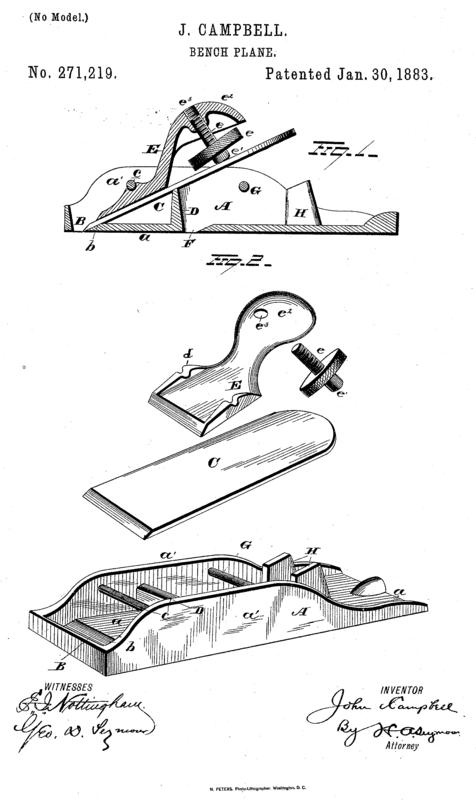 My invention relates to planes, the object being to provide a plane adapted for use either as a chamfer or smoothing plane, of such construction as to be readily adjusted. The invention consists in the peculiar construction and combinations of parts herein after described, and pointed out in the claim. In the drawings, Figure I represents a perspective view of my improvement, and Fig. 2 is a view-of the parts detached. A represents thestock of the plane, consisting of the sole a and sides a' a'. The sole is provided at its forward end with a slot, B, and beveled seat b for the point of the bit.. The bit or plane-iron C is adapted to project under a rod, c, set into the sides of the stock, and to rest on a beveled. bed or rest, D. A wedge, E, is then forced under the rod c, and is held go in place by a screw, e, provided with a disk or head, c', which bears against the upper end of the bit. The upper end of the wedge B is rounded and curved to form a bearing, e2, for the hand or fingers, and is provided with a central screw-threaded perforation, e3, adapted to receive the screw e. This wedge E. is also provided with upwardiv-proiecting side ears, d, which latter are centrally grooved for the parpose of preventing the wedge from rising up when secured in place. When the wedge is unscrewed, the bit is firmly clamped, while by turning the screw into the perforation of the wedge the bit is loosened and may be removed. The sole a of the stock is provided with a second slot, F, just in rear of the rest D, while a rod, G, is secured between the sides in rear of the slot F, and two projecting beveled rests, H, are provided adjacent to the rod. Thus it will be seen that the bit may be secured at the forward end of the stock 'to form a chamfer-plane, or at the center to form a smoothing-plane. The parts arc simple in construction, easily manipulated, and adapted to. be durable and efficient in use. The combination, with the stock provided with two transverse slots, one of which latter is situated near the extreme front end thereof, the beveled rests D and H, and the transverse rods c and G, of the removable bit, the wedge E, having the slotted side ears, d, and the fast- ening-screw, all of the above parts combined 65 and adapted for the purpose set forth. In testimony whereof I have signed this specification in the presence of two subscribing witnesses.